I've got today following lens by mistake. I guess it is a large format of some kind. Laack Rathenow was a german company which made lenses for cameras, binocluars and microscopes. 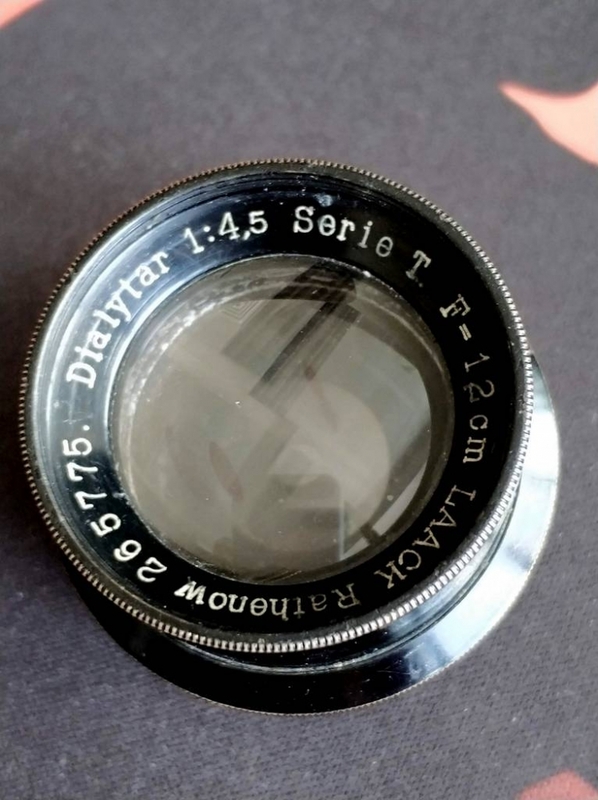 The Dialytar name was used on several lenses of different design and maximum aperture. The one you have, a LAACK Rathenow Dialytar 1:4,5 Serie T F=12cm is a straight-ahead Tessar (Series T) type lens, 3 groups, four elements. 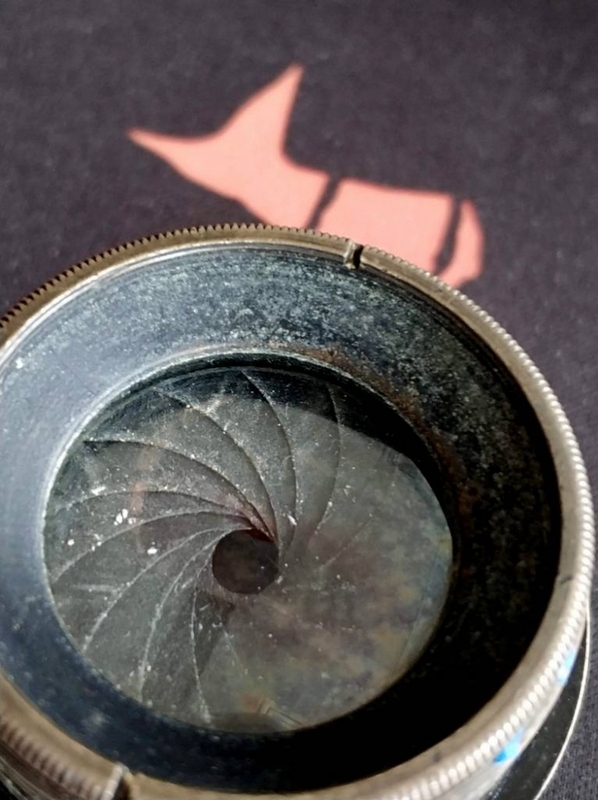 Laack lenses such as this can be found on a wide variety of folding cameras, tropical cameras, and large format cameras. The 120 mm focal length of your example probably indicates it came off of a camera with somewhere between a 6x9 cm and 9x12 cm format. 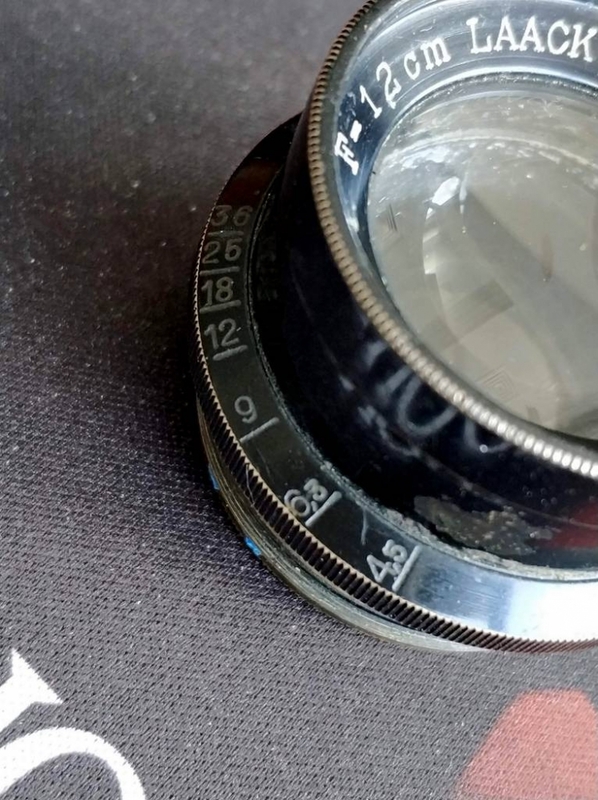 The lack of a focus mount and the fine mounting threads at the rear probably indicates that this lens was either screwed in to a leaf shutter at some point, or may be a "lens in barrel" without shutter which was used on a camera with a focal plane shutter like a Graflex. I have a bunch of Laack lenses in various configurations and have never had the time to really try them out, but they have a fair reputation. Yours being a Tessar should produce nice results, especially at modest apertures. It should produce the nice vintage 3-D look which Tessars are know for. Conrer performance wide open will probably not be up to modern standards and you will see some coma, vignetting, and other aberrations not found on more highly corrected modern optics. This is not necessarily a bad thing. The lens in uncoated, which means it may exhibit a fair amount of veiling flare and low contrast, especially when shot into the sun or bright lights - use a lens hood if you can fashion one. Finally, it looks like there is some haze on the optics, much of which you should be able to carefully clean up with 50/50 mix of ammonia and Hydrogen Peroxide. I've seen a tropical plate camera from 1924 with Compur shutter and the same lens. So it will be pretty useless on a Sony Nex i guess since it was made for a bigger format. If it fits in the Compur shutter is should work fine on that plate camera! Don't give up on the Nex, though. It could work very nicely as a portrait lens. I think you mean "pretty useless on nex without a focus helical." Being for larger format is no problem. Lens will be 120 mm on nex. Should work fine on bellows on your Sony. 12cm/120mm will give enough back focus for most adapted bellows to reach infinity on SLRs. 12cm was a typical focal length on earlier 6x9 plate cameras (often supplied with roll backs). I have several. I thought Dialyt meant 4 in 4 symmetrical design usually. But who knows. Need to check the Vade Mecum. Looking forward to seeing some results! It looks like very sharp when stopped down to f9 - contrary to what i was expecting from a 1924 lens. Flares a lot, i mean a lot. Stopping it further just flares even badly - i guess sensor reflections. And needs a lens hood with at least 10 cm length, but looks like fun almost sorry that i have forgot to take it it on my holidays. Will try to make some flower photos with it.